From Josselin Desmars we got a new update, which showed the track a few hundered km more south. Keep in mind, this has still an error of about +/- 100km or more! Its about +/- 5.4mas in RA and +/- 2.6mas in Decl. The update includes now more DR2 stars with proper motions. 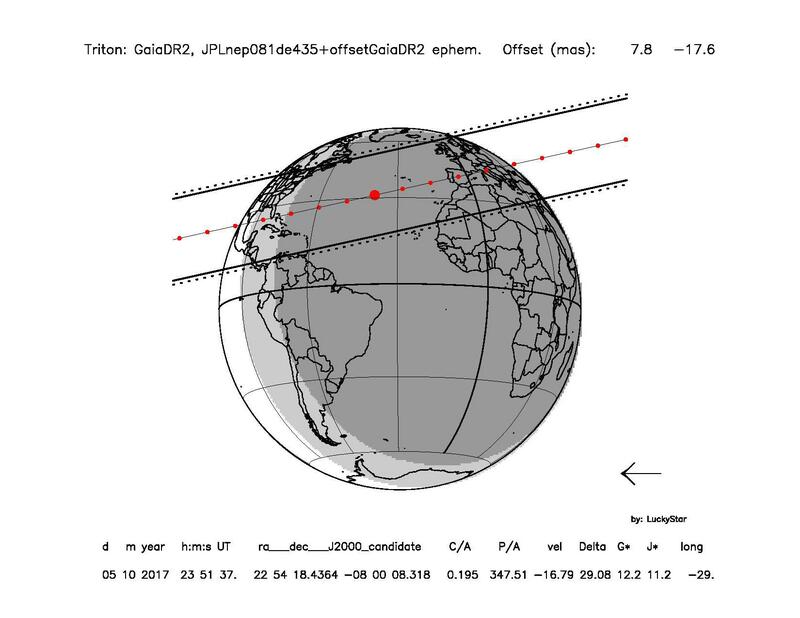 A new update of the occultation track has been calulated by Josselin Desmars on the basis of observations of the RIO team of 8 nights. We are now confident in the prediction since the precision is about 100km on the path (projected on the sky so a bit more projected on the Earth surface)"
Triton occults a 12m4 star UCAC4 410-143659 visible from the USA and Europe. The occultation will not only allow to improve Triton's orbit, but will also allow to follow the development of its thin atmosphere. After many years, this is a great opportunity to monitor Triton's atmosphere. The last occultation reported was in the year 2008. The upcoming occultation is an important chance, to get data about the current status of Triton's atmosphere. Triton has an atmosphere, mostly nitrogen, very comparable to Pluto. Triton is in a distance to the sun, which is around the same, as Pluto at its perhelion. The size of Triton is very similar to the size of Pluto. The atmosphere of Triton undergoes certain variations, as monitored by stellar occultations. These variations result from the orientations of its orbital plane and spin axis. The Triton's precession period of about 680 years adds more complexicity to it. Currently, the southern hemisphere is more and more illuminated by the sun. Before there had been harsh winter conditions. This all contributes to changes in the atmosphere, which can be followed by occultation astronomy even for small telescopes. 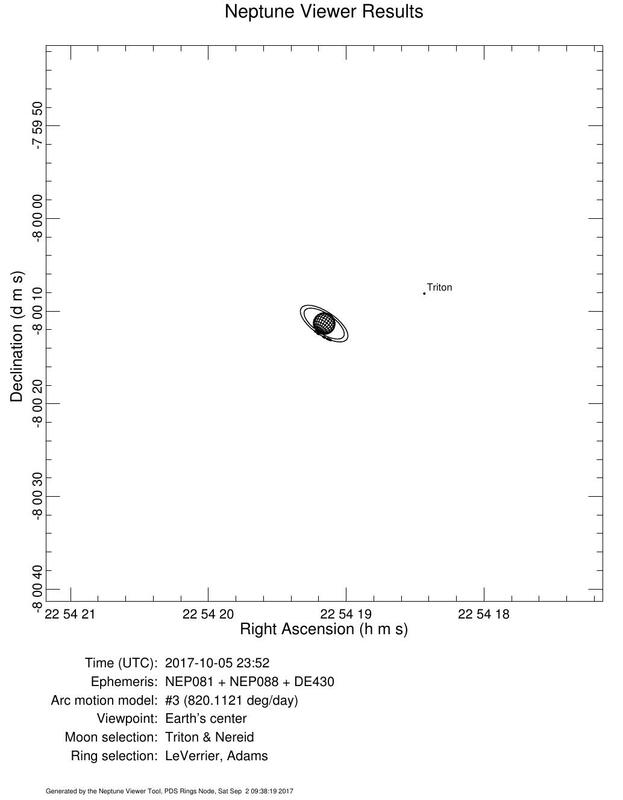 As can be seen from the graphic below, which shows the occultation track as predicted by Bruno Sicardy using the DE435 ephemeris. For the star the DR2 position is used, therefore there should be no considerable updates in stellar positions. The occultation is very favorable for many parts of Europe, which is a highly telescope-populated area. Think of the success of the Pluto occultation last year. As can be seen, the Central Flash also passes central Europe. For measurement of the Central Flash (CF) a good occultation track is necessary. Updates for Triton's positions will be made by the RIO group and changes in Triton's orbit may be in the order of 100 km in north-south direction. Since the flash is itself ~100 km wide, it is still premature to start with station positioning right now. Detailed planning for Central Flash hunting will be published here later. The observations is somewhat difficult. Triton is only about 11.4 arcsec away of Neptune. Any "CCD bleeding" of the bright light from Neptune should be avoided. If Neptune should be used as intensity reference for analysis later, care has to be taken, to guarantee, that no part of Neptun's image is saturated. For this, only 12 and better 16 Bit cameras can be used. This should be tested beforehand! The full moon is only 33 degrees away, reflections may occur in the telescope. The situation however is much comfortable as with the Pluto occultation last year, where the distance was only 14 degrees. 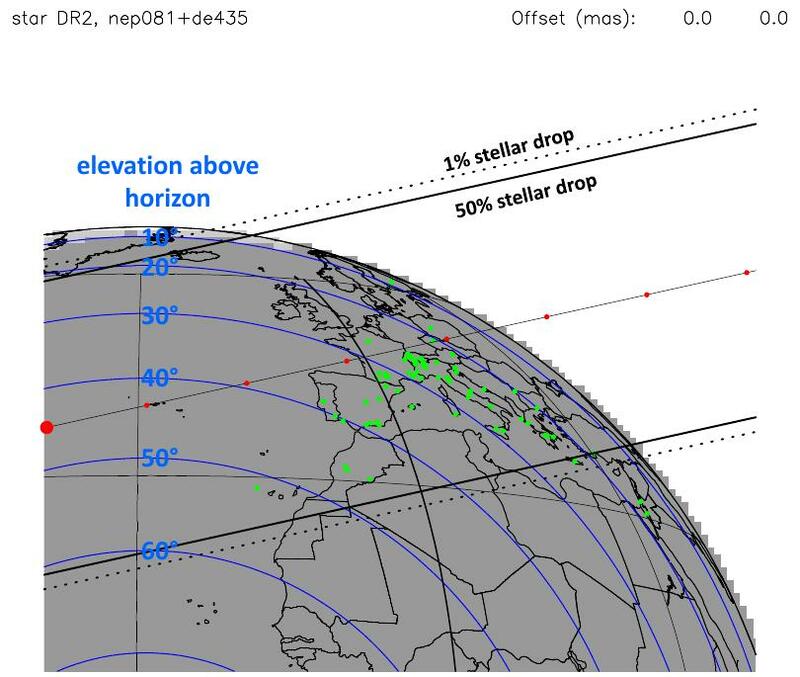 The elevation of Neptune above the horizon during the time of occultation is shown in the map above. This may help for further planning. From the Neptune Viewer Tool, PDS Rings Node, a graphic could be generated, how the Netpune system looks during time of the occultation. 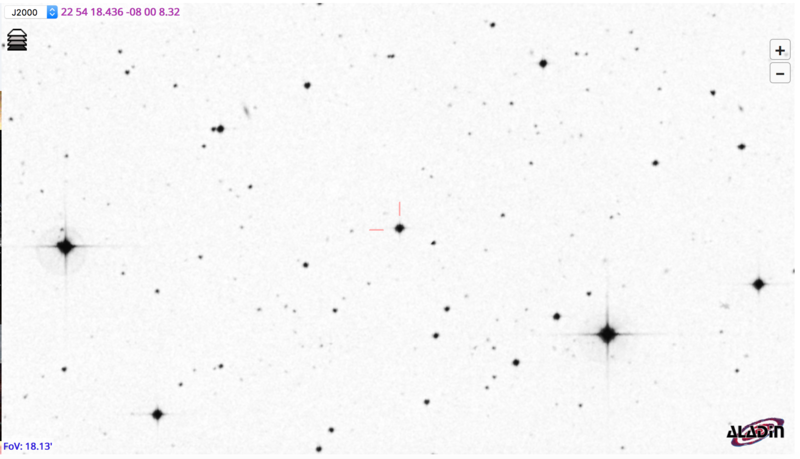 In order to give you an idea, what stars for photometric references can be used, here you find 2 charts. The field of view in each chart is 18.3 arcmin. 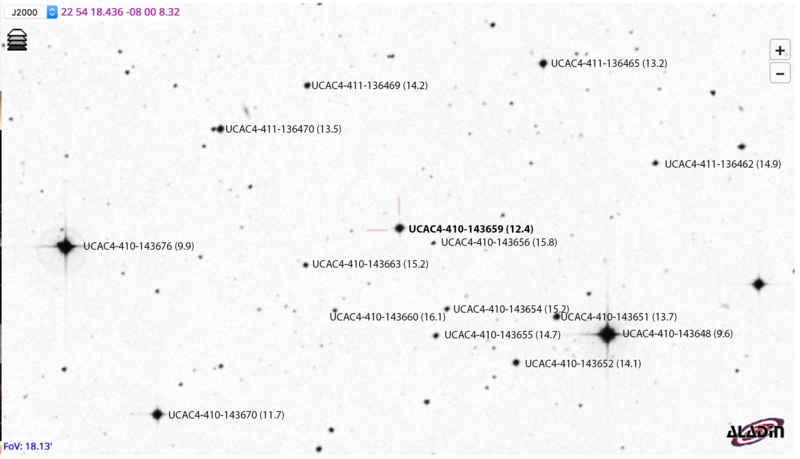 The first chart gives the star field without designations, in the second some designations including magnitudes are given. with many practical informations about observation techniques. for the event, with a lot of infos also about the physics and the atmosphere. has a website directly from the group who provides predictions. Thanks to Bruno Sicardy and Josselin Desmars!